Thanks to a prestigious, $1 million grant from the W.M. Keck Foundation, researchers at Montana State University will be expanding their investigations into how microorganisms thrive in the hostile conditions of Yellowstone’s hot springs, work that may one day lead to new discoveries in medicine, energy, materials and other fields. Based in Los Angeles, the W. M. Keck Foundation was established in 1954 by the late W. M. Keck, founder of the Superior Oil Company. The Foundation’s grant making is focused primarily on pioneering efforts in the areas of medical research, science and engineering and undergraduate education. The Foundation also maintains a Southern California Grant Program that provides support for the Los Angeles community, with a special emphasis on children and youth. For more information, please visit www. wmkeck.org. The foundation awarded the grant for collaborative work in MSU’s interdisciplinary Thermal Biology Institute (TBI), led by Brent Peyton, a professor of chemical and biological engineering. Established in 1999, MSU’s Thermal Biology Institute is recognized internationally for its work on organisms living in extreme high temperature environments. One of the institute’s strengths is its multi-disciplinary team of researchers. In addition to Peyton, other MSU faculty working on the Keck-funded project include: Brian Bothner, chemistry and biochemistry; Eric Boyd,microbiology and immunology; Ross Carlson, chemical and biological engineering; Valerie Copie, chemistry and biochemistry; Matthew Fields, director of MSU’s Center for Biofilm Engineering; Robin Gerlach, chemical and biological engineering; and Bill Inskeep, land resources and environmental sciences. Peyton and other researchers will be using the Keck grant to learn more about the heat-loving Archaea found in some of Yellowstone’s hot springs. Different from bacteria and maybe older than viruses, Archaea are close ancestors to Earth’s earliest life forms from 4 billion years ago. 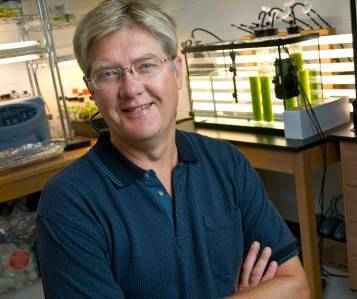 MSU chemical and biological engineering professor Brent Peyton is pictured in a lab at Montana State University. Thanks to a prestigious, $1 million grant from the W.M. Keck Foundation, Peyton and other MSU researchers will be expanding their investigations into how microorganisms thrive in the hostile conditions of Yellowstone’s hot springs, work that may one day lead to new discoveries in medicine, energy, materials and other fields. MSU photo by Kelly Gorham. Understanding how these alkaliphilic, or caustic-loving, archaea use enzymes to convert woody materials into their food—a process known as chemosynthesis—may open unimaginable opportunities. “For these organisms to take a stick or leaf that falls into their boiling, caustic environment and turn it into sugar – their food source – is incredible. It’s a trick that Mother Nature learned and she is not going to share that secret easily,” Peyton said. Yellowstone’s hot springs have already demonstrated the enormous potential of their organisms and the enormous fundamental research required to harness them. In 1966, researcher Thomas Brock discovered the microbe Thermus aquaticus in Yellowstone’s Mushroom hot springs. An enzyme – the same class of molecule Peyton and his colleagues will examine -- in Thermus aquaticus would become the basis for the multibillion-dollar DNA sequencing revolution that began in the mid-1980s and which continues to revolutionize science, medicine and crime forensics to this day. However, the work required to bring the Thermus aquaticus enzyme to its commercial fruition was enormous. The archaea’s durable enzymes may also hold a similar promise, but first Peyton said scientists must learn to cultivate the microorganisms in the laboratory. Such fundamental science will lay the foundation for other, more commercially oriented research, Peyton said. Peyton and his colleagues in the Thermal Biology Institute will use part of the Keck grant to launch a multidisciplinary lab-based honors course called “Extreme Microbiology of Yellowstone.” Twelve undergraduate students—six microbiology students and six bioengineering students— will participate annually to study the genetic material that comprise these durable microorganisms common to Yellowstone’s hot springs. “That’s part of the beauty of MSU,” Peyton said. “We can involve undergraduates in our work on the very frontiers of science. It’s exhilarating for the students and for those of us who teach them,” Peyton said.